You should maintain your identity, especially as employers want to manage your behaviors. Let me be clear, I am a proponent of a company culture that defines how you must act while working for a company. A strong culture impacts a company’s success: better ideas, more engagement, and improved retention. It also has the potential to make you (as an employee) smarter, happier, and more productive. Still, you do not want to lose track of who you are – your essence. Adopt the expectations of an employer for as long as you are required, yet always keep in mind what expectations are a true reflection of you. Keep a perspective. Later you might choose to stay or go based on these self-reflections; moreover, it becomes an important maturation process. I come from both angles: a leader defining a company culture and a professional projecting a personal brand (which I argue has a critical identity element). I created a ‘standing constitution’ defining values and behaviors everyone should follow. [ii] For many companies, it gets much deeper than simply writing down expectations. New applications monitor and collect data based on behaviors and competencies of all workers. Management has desired outcomes. They monitor behaviors, analyze the results, and then make decisions. They encourage employees to adopt their behaviors, usually with contingencies. They train employees to modify their behaviors. I created a model for professionals to project their personal brand onto networks; it includes a critical identity element. (The book is Online Personal Brand: Skill Set, Aura, and Identity.) A central premise is professionals become their own advocates. A professional has desired outcomes. A professional communicates how he or she wants to be perceived, has internal beliefs, and is prepared to respond and negotiate based on his or her own convictions. Be prepared and proactive. Pull feedback to you. [iii] Find ways to advance your career goals. Listen to all suggestions. A company has invested to correctly measure your competencies; management has data and analysis to back up their assertions. Not always a matter of right and wrong. You are who you are. Some things are worth changing, some things are not worth changing. Some things cannot be changed. Keep a diary. Take note of your observations of a company culture as it evolves. Maybe it is simply an acknowledgement of how you feel; maybe it inspires you to make changes or decide to leave. Separate identity in social. Social media makes it more difficult to have an identity. Separate how you represent yourself versus your company. Moreover, make sure your self-representation is not detrimental to your company representation. I am a firm believer in the potential of a company culture. So my advice to you, as a professional, is to consider a company culture from the start – while applying and interviewing for the job. 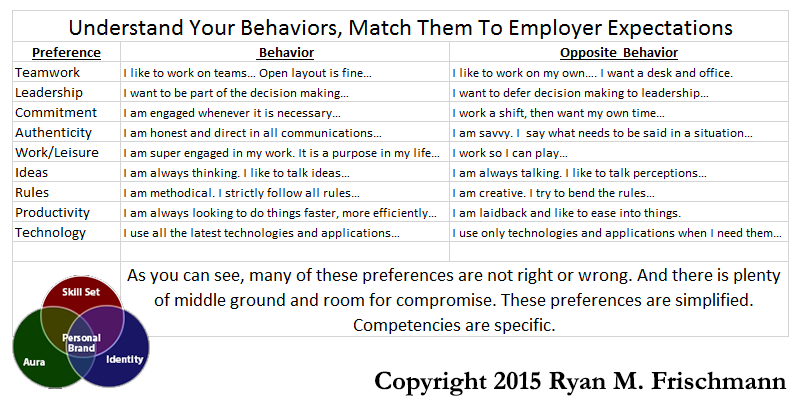 Recently, I saw a job posting where a company listed behaviors the company likes and dislikes. I went through the list checking what fits me. Right away I knew whether I wanted to be part of the company. Once employed, observe how a company culture is evolving. Do you stand behind what the company is trying to accomplish? Do you agree with the expectations? Are you willing to suggest changing the culture? Are you in for the short or long term? “Last year, the median job tenure for workers aged 20 to 24 was shorter than 16 months. For those aged 25 to 34, it was three years, according to the BLS”. [v] LinkedIn managers call this period: ‘tours of duty’. This means, if you are an early career professional, you have a mutual understanding with an employer that after the period has completed you will renegotiate your terms of employment. Take full advantage of this period to determine if your personal brand coincides with the company culture. Keep your identity, part of an online personal brand and more importantly who you are as a person. [iii] Douglas Stone and Sheila Heen. Thanks for the Feedback: The Science and Art of Receiving Feedback Well. Penguin (2014, New York). What’s the Rush in Putting up a Personal Website? One clear signal I get from students and professionals is that they want to build a personal website fast. So companies offering these services advertise how quickly you can have it up and running. Let’s say the average time is to have one up in five minutes. My issue with convenience and haste is the cost it might have on your reputation. A personal website significantly impacts your online personal brand (aura and identity in particular), so I advise getting everything right before publishing it. However, I acknowledge most professionals do not want to waste any time. According to a survey I conducted in early 2014, seventy-one percent of Millennials are ‘not sure a personal website is worth the expense’ (time and money). [i] Considering there are many free services out there, time becomes the big factor. 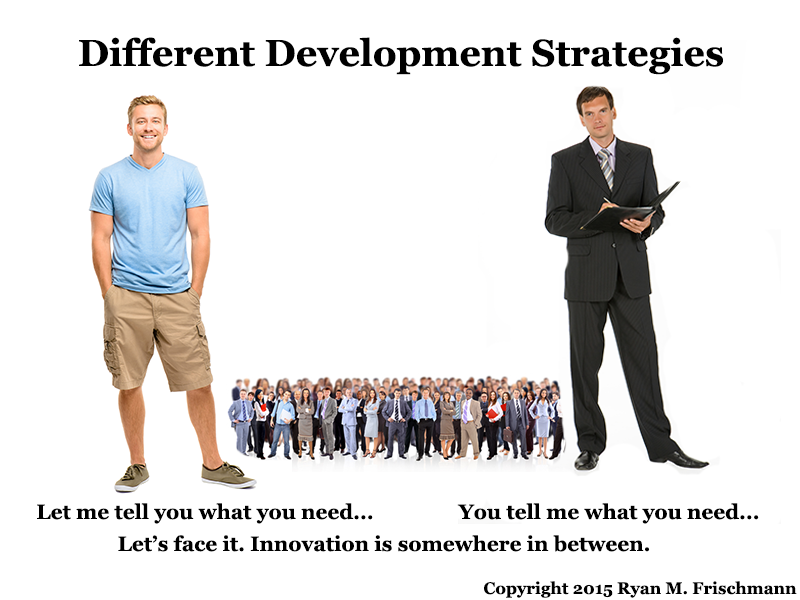 My business education is tugging at me saying you must meet your customer needs, and my IT designer experience- Steve Jobs inspired – is tugging at me saying you can tell the customer what they need. Believe me, I know you must have a solid relationship with your customer base and listen to their requests. Importing information from a LinkedIn profile. This feature is necessary because it not only saves time, but also reduces errors. As you retype information in a website interface, there is a natural tendency for typos. Use of stock images for style and layout. It is easy to retrieve stock images (where you pay to use an image someone else created without any direct input from you). This is fast and easy. However, using images you or a you-guided photographer creates is more meaningful. Perhaps use stock images to get your website up, but get your own images in the long-run. Uploading content. A big component of a personal website is getting your content on the server; this includes photo galleries, documents, presentations, videos, etc. It is helpful if the uploading process is quick and painless. A great feature is to directly link to online storage drives such as DropBox, Google Drive, or Microsoft One Drive. Integrated with social media. Much of your online presence already exists on your social media accounts, so you want widgets that display related content. Bringing in social media feeds quickly adds substance to your personal website. To conclude, think about a company building its website. Does it want to put something up as fast as it can? Is it not concerned how every graphic and wording is crafted as a portrayal of the company brand? To some extent, a professional should have similar expectations and care with his or her website. A personal website is the cornerstone of an effective online personal brand. [i] Ryan Frischmann. Online Personal Brand: Skill Set, Aura, and Identity. (July 2014). Author TheProfessionalWebsitePosted on March 12, 2015 June 21, 2015 Categories Designing Personal Website, LeadershipTags personal brand, personal websiteLeave a comment on What’s the Rush in Putting up a Personal Website? I am reading books on new-age methods for finding employment, essentially utilizing social media and creating an online presence to build a personal brand. (A personal website should be the centerpiece of it all.) In a difficult job market, some of these methods are useful: show career vision (skill set), add professional connections, draw recruiters and potential employers to you (pull approach), and provide a striking appearance of you (a multi-dimensional, social resume). However, I think many of the experts leave out properly addressing a target audience and therefore, often cater to the elite. Not everyone can have thousands of Twitter followers or hundreds of LinkedIn connections, and many of us do not have Google or Microsoft on our radar as a potential employer. Yet I think most professionals benefit in building a personal brand. When I think of effective targeting, I think of a phrase an Italian friend says to me about expanding his business; his slogan is “Gotta Guy”. He is a handyman, so in his context it refers to finding someone who can do a particular job locally; for example, it might refer to a plumber, woodworker, electrician, and so on. However, I think it works in a much broader context. You can become “that guy” or “that gal” for just about anything (including many of our service professions): “website guy” or “graphics gal” or “SEO guy” or “computer guy” or “bank gal” or “accountant guy”… And with the internet and social media you can connect to your own ecosystem – clients, associates, and employers. The boundaries of your ecosystem might be defined by where you live, an alumni network, past or present employers, personal connections, and perhaps other societal factors. In this way, by using specific targeting, you are not taking a “pie in the sky” approach but rather a coordinated approach to developing a personal brand. For example, in social media, effective targeting might put more value in the quality of connections, rather than the quantity of them. Introducing a pull approach while you seek employment can be highly efficient and effective. Publish your skill set in LinkedIn and MonsterJobs and give recruiters an opportunity to find you and, once they find you, show them the “best you” on a personal website. Another example of the “that guy” approach can be found in regional business networking organizations. Think about the setup of a typical Business Network International (“BNI”) group. Each person is guaranteed a unique identity within the group. For example, there is one accountant, graphic designer, insurance agent, website developer, banker, etc.. The organization meets to share leads, springboard ideas, and build rapport within the community. 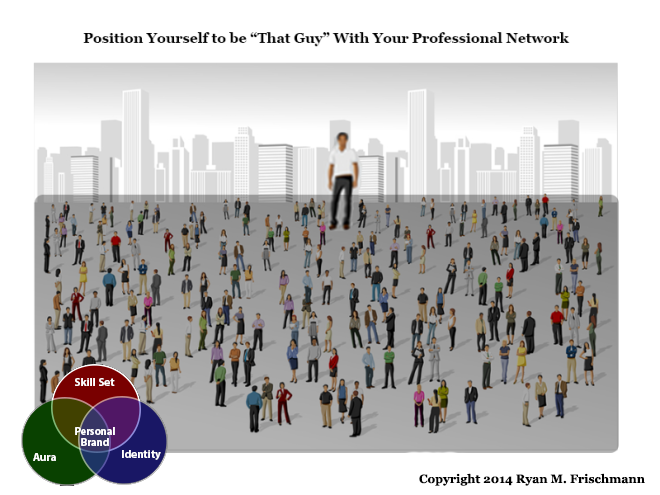 So with personal branding, you take the “that guy” approach online and utilize social media to build your network. You may or may not be constrained by the community you live in; nevertheless, you should be able to carve out your own niche. To differentiate in a larger network, you may need to add a qualifier based on your strengths or knowledgebase. Still the idea is to build a personal brand by becoming… “that guy”. [i] Nelson Wang. The Resume is Dead (Self-published, 2012). I want to summarize some of the key points from the last three blogs where I discussed what might replace the traditional resume and the concept of a professional identity and incorporated insights from publications by reputable authors (Dan Schawbel in Forbes, Sudy Bharadwaj in Mashable , and Susanne Markgren in College & Research Libraries). In this blog, I want to introduce some of the concepts from a LifeHacker blog written by Alan Henry called “How to Clean Up Your Online Presence and Make a Great First Impression”; LifeHacker has a large following and can be considered the pulse of the younger generation regarding personal branding. I have two overarching conclusions. First, it is clear that a resume is going to morph into something new, something that takes advantage of the functionality of the internet including: delivering various types of media, enabling better interactivity, and using identities and networks. Second, there is this idea of a “professional identity” or “online portfolio” or “online presence” or “nameplate site” which is essentially a personal website with your own domain that acts as the primary node for all your interactions on the internet. Recruiters are finding it more efficient to seek out candidates. This means there needs to be an accessible search mechanism, which requires a search engine and an index of personal websites or profiles. Higher employee turnover. In his article, Mr. Schawbel shares a startling stat that 84% of employees plan to look for a new job in 2011; people are on the move looking for the next best opportunity. Accessibility to other forms of media. It is easy to deliver social media, video, files and rich text through the internet; this adds dimensions to an employment evaluation (as Mr. Bharadwaj argues in his article). Facilitating the process. Adding interactivity, with searching, communication, and navigation functionality, is easy to do with a professional website. Get a personal professional website with your own domain name. This is your “home base” on the internet, a landing page for all your social media profiles. Be prepared for what content about you is already out there. People are going to look for information about you on the internet. Mr. Henry suggests conducting a “vanity search” on Google to see what others are going to see when they search on your name. Control how you are represented in search engines; you can setup an SEO (“search engine optimization”) and “clean up” what is already out there. Publish content in a professional way. There is a thin line between what is considered professional versus personal. Ms. Marken says to consider publishing everything in a professional context, and Mr. Henry says to consider using anonymity when you publish personal content. Present yourself in a flattering way. Consider the way you represent yourself with a resume, you want to standout as much as possible; don’t worry about possibly sounding conceited, though make sure you are accurate. On Quora, somebody posed the question: “Does a well-designed professional looking personal website make you look conceited?” and it elicited some good responses. Can Social Media Replace a Resume? Mr. Bharadwaj argues that social media profiles are a better representation of a candidate’s personal brand. I agree that social media profiles are an improvement from the traditional resume in some ways, but I think a professional website is an improvement from social media profiles. A LinkedIn profile has the most depth and could be used in a basic employment evaluation; however it does not yet use all types of media available on the internet and does not have much latitude in promoting a “personal brand” with a visual appealing presentation. Think about it, when a company promotes their brand with an advertisement, how much of their presentation is visual as compared to textual (like a resume, or a LinkedIn profile); obviously the underlying meaning trumps anything else, but there is value in displaying style and using other forms of media rather than straight text – it adds another dimension. I think a professional website is more functional and visually appealing than social media profiles and therefore a better way to present a personal brand (both are better than a resume). There are some social media outlets where candidates can show creativity, such as Pinterest, YouTube, and Tumblr (as Mr. Bharadwaj mentions), and demonstrating ingenuity is a good thing. However, I do not think we should completely abandon all aspects of the resume for two reasons. First, social media profiles are not comprehensive enough. For example, you can upload a great video resume on YouTube but would the video have enough information to make an employment evaluation – probably not. Second, there has to be a common platform to make proper comparisons (i.e. apples to apples); a resume is standardized and is commonly recognized in every industry. A professional website solves these two problems. A professional website has all the content and structure of a resume with advanced functionality to promote communication and interactivity. It also supports all types of media in one place. Mr. Bharadwaj suggests that adding various types of media, such as a video, allows for candidates to “present themselves three-dimensionally”. I often refer to a professional website as a “multi-dimensional resume” for this reason. Ditto the arguments made above. I guess it is worth showing you understand the nuances of social media, though this is vague. Learning the “ins” and “outs” of social media is usually straightforward; some users might be more advanced than others but I am not sure how much of an impact that should have with an employment evaluation (unless it is what you will be doing everyday). My answer to Mr. Bharadwaj’s question, “should recruiters stop accepting traditional resumes”, is yes. However, I think rather than social media, a professional website is a better platform for employment evaluations. I agree with Mr. Bharadwaj that social media can expand creativity and provide a much richer experience for recruiters, however, only piecemeal. LinkedIn has the best profile for an employment evaluation but is still not complete. A professional website brings everything together. Author TheProfessionalWebsitePosted on November 30, 2012 November 30, 2012 Categories Online IdentityTags marketing, media profiles, personal brand, social media, technologyLeave a comment on Can Social Media Replace a Resume?